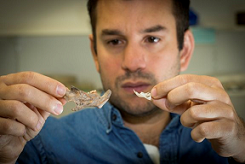 Julien is a vertebrate palaeoecologist focusing on the fossil mammal record of the last five million years. He received a Bachelor of Mathematics from the University of Newcastle, Australia, and a Bachelor of Sciences (Hons) and PhD from the University of New South Wales, Sydney. His current research projects span Australian marsupial palaeontology, community ecology of late Quaternary small mammal assemblages from Asia, and hominin and large mammal palaeoecological research of the Plio-Pleistocene of East Africa and Southeast Asia.